I went there, to Sissinghurst, back in the day. I was really excited to visit – but I think it was between seasons because the garden was fairly unmemorable and frankly a little blah. Despite my new friends oohs and ahs of encouraging delight I preferred to wander as far into the house as I could – this I found most delightful. I’m sorry about your excursion into a colourful wall turning out badly – you do have to test pot and swatch to see the colours in different lights etc. Don’t give up – when you find the colour you like, you’ll love it! Hi Pauline – and thanks for the belated wishes! I think I hit Sissinghurst just at the right time : early June. 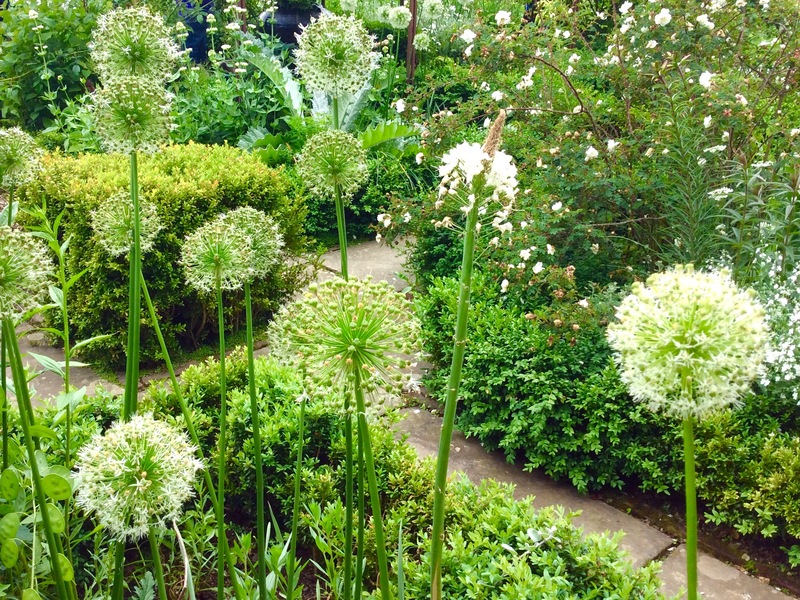 The White Garden looked especially wonderful, as did the irises, which are my all time favourite flower. I ‘Trust’ you are familiar with Sue Limb’s ‘Gloomsbury’ on Radio 4? It’s amazing how the getting-older stuff that’s supposed to be advantageous often turns out to be disappointing while the annoying getting-older stuff (I have no idea who you are, so stop calling me dear) just gets old (and frequent). Welcome to the ‘ blood-sucking pensioners’ brigade. I can’t believe you are that old young! We have been members of the NT since 2006 when we came down to Cornwall and realised that most of the places we wanted to see belonged to them so it was a decision based on meanness. Still, after having survived the five years to obtain the coveted seniors’ passes we still get our moneys-worth. We tootle off to any NT place wherever we visit in this country and also in Scotland so it has been worth the price. 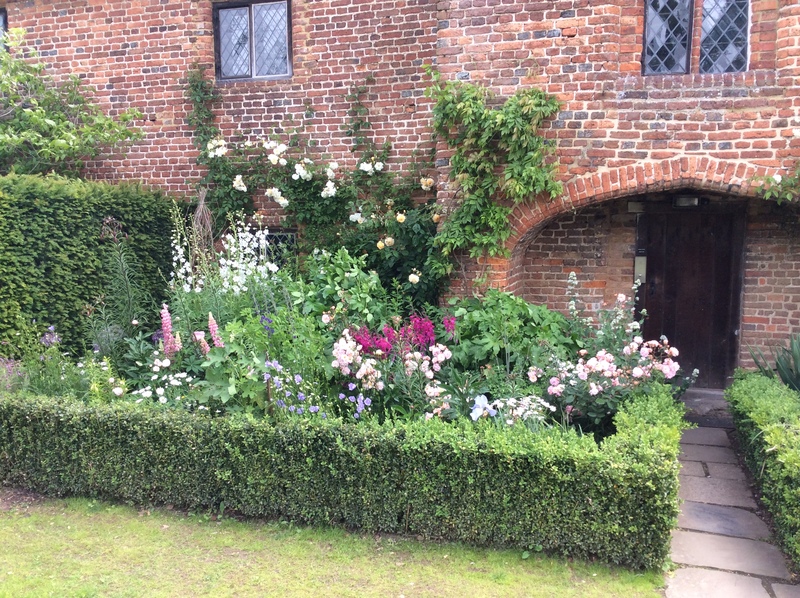 There truly are some gorgeous gardens and Sissinghurst is one of them. Best after the coaches have disappeared though. 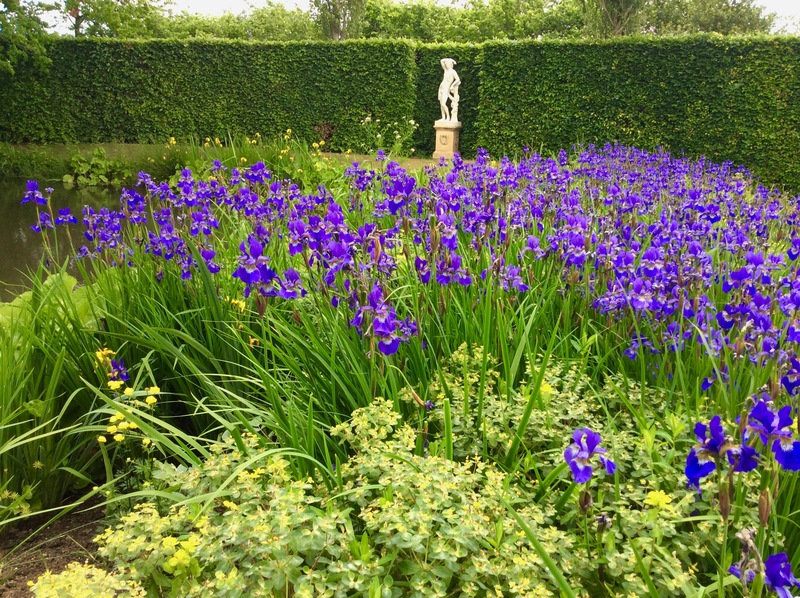 Try Bateman’s and Nymans too if you like a pretty garden and further afield Hidcote is unmissable and open until 7 pm. As for feature walls, they are overrated IMO. I can see membership will have its advantages although I can’t imagine having it for five years…there’s not enough around here that I would want to do multiple visits, but you never know…. Nymans is very much on the imminent list. The SSF (sea – sick friend) and I will be going there in a couple of weeks time. Years ago, I was in Scotland walking into a gift shop and a woman approached and suggested I might like to join the National Trust and I remember looking at her for a moment and then replying in distinctly un-English tones “Thank you, but I don’t live here.” I think they wanted 40pounds (about $80 at the time) and she suggested that I might benefit even on my short sojourn. What a hoot, but I got the idea they’re hard sellers those folks. I do belong to the American equivalent because some of the properties are so nice and they also work to save less grand historic properties. 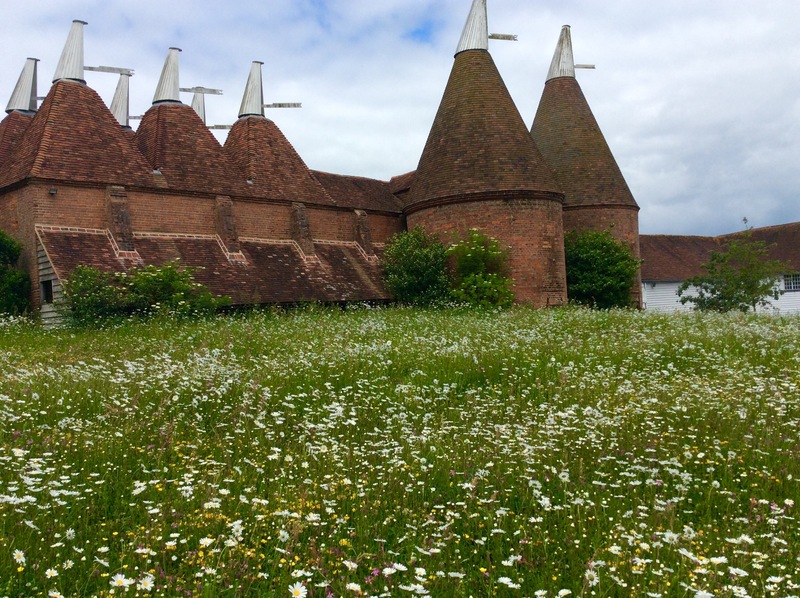 I have had Sissinghurst on my list for the next UK trip and your photos show it to be absolutely lovely. Nice there’s a cafe there!! You can wander the gardens for ages without fear of impending low blood sugar! I just turned 60 in June and have yet to take advantage of any perks. Good luck with yours. Well, I hope you make it there on your next UK trip. Sadly, the National Trust doesn’t let you take a friend with you on a membership card, otherwise I’d have offered to meet you there, Lisa! Yes, they do the hard sell. I’m always getting leaflets through the door, enticing me to join up or bequeath to them in my will. It goes against the grain really to be associated but they do maintain some of our vulnerable buildings so I can’t be too blinkered! Yes, now-a-days, Virginia Woolf and Vita Sackville West might well have married each other. It seems mind boggling that the husbands lived with lesbian partners. Even so, each to their own. Queen Victoria has a lot to answer for. She certainly does! Have you had the recent TV Drama about her young life? Quite a gal, apparently. Not sure how true to life it was but it had high ratings.. I believe that Harold Nicholson also had dalliances with young men. They were all connected to the Bloomsbury group, who were, at best, bohemian. A fun post, Jenny, with some beautiful photographs. Your painting reminds me of my painting our dog on his way out of the room in Soho. This was to cover the grime he left on the wall as he slid in and out. We have enjoyed our NT membership, but are letting it lapse this August because there is a paucity of attractions within striking distance for us. And there, you have hit the proverbial nail…there are only so many times you can visit the same places before the novelty wears off. There aren’t many stately homes around here either, so once I’ve done them all, probably this year, I doubt I’ll be rushing to renew. Like you, I find myself in a real dilemma with regards to NT. I was a member for years – no concession for single parent family in those days. No concession for age, can’t take a friend. Gave up. Visit occasionally and pay full price. Very sad. Not a good idea to upset your core constituency, as others have recently discovered. Onward and upward. Hoping to go to Dulwich to see John Singer S. paintings.Cheaper entry for the elderly…. Yes, that’s a thought – single parents. There are certainly enough of the buggy brigade around NT properties to suggest that that age group are interested. I love your constituency analogy…wish I’d thought of that one, dammit! Oh, and Dulwich is a nice little Gallery. Went there for the Vanessa Bell. There is an exhibition of Singer Sargeant at Igtham Mote, so I’ll probably do that one. I did not know that oap NT rule. Good job I joined last month aged 48. Ps my husband refuses to put car sticker in window so we just leave the guide book on dashboard. Hi Lana, nice to meet you. That’s a great tip – I hate sticking things to the windscreen. Well, if you manage five years worth you’ll be well in when you get to my age! Here’s to you for joining the National Trust. My favorite part of a well loved author, beyond her sweet drawings with watercolors and charming stories is that Beatrix Potter donated many, many acres of land to the trust! Women in her time period rarely supported themselves nor had their books published, as she asked they be made small for children’s petite hands and colorful which cost extra money. Now, here’s to the beauty in your tour given to us, free of charge! 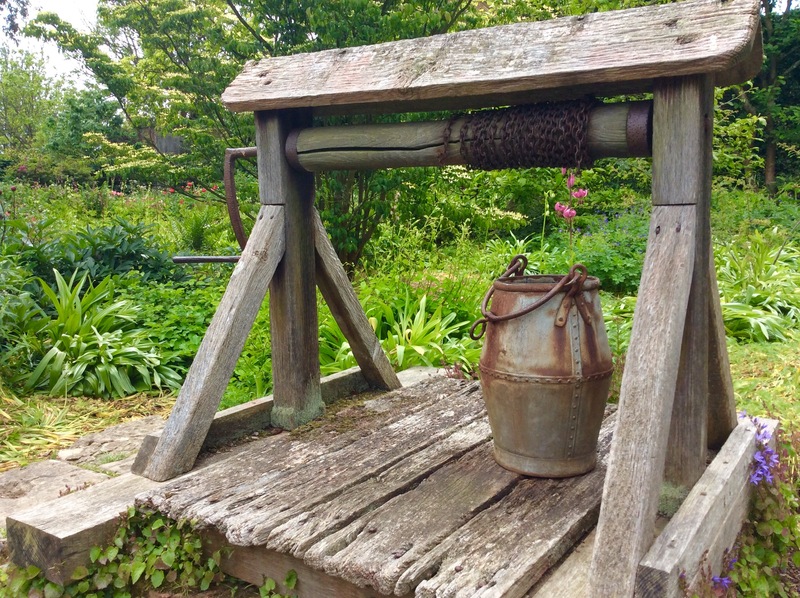 Thank you for showing green vines against weathered wooden shelves with potted plants and the wooden well frame with rusted bucket. I like these quaint items. 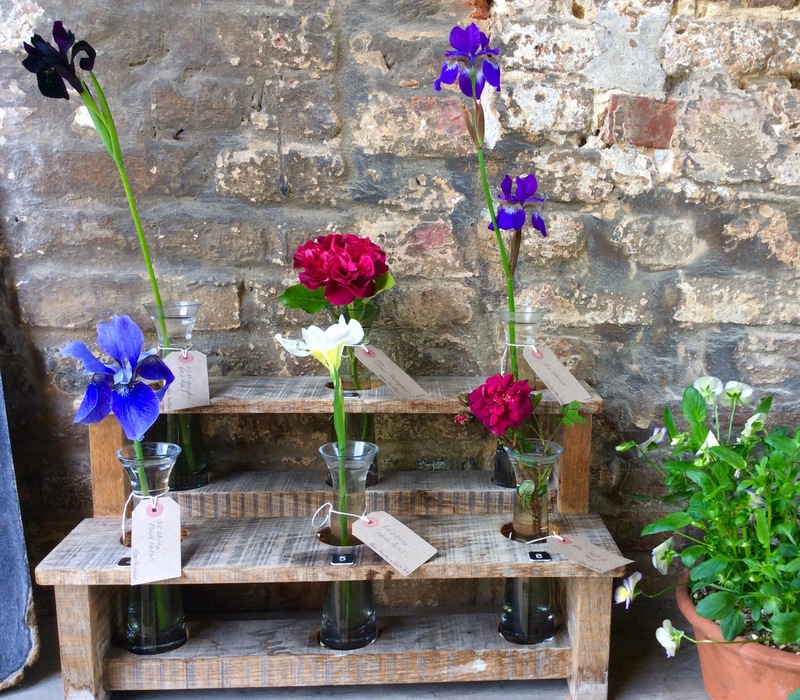 The pretty flowers which are tall and purple with white catch my eyes and the pretty brick wall with archway and country garden were lovely, too. You are a fine photographer, Jenny. Photography is easy with an iPad, Robin – no camera technique needed at all – maybe just luck to spot something that is photogenic. 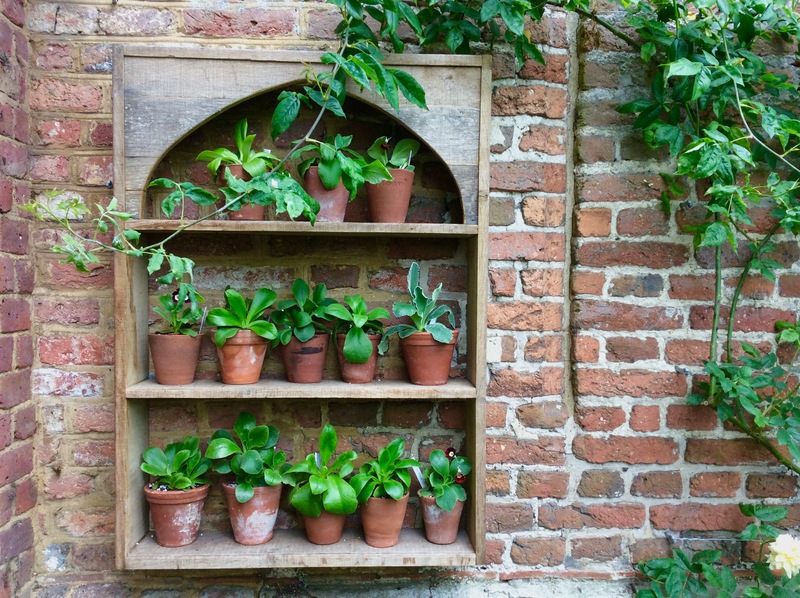 I love those potted plants too – the display is very Victorian. 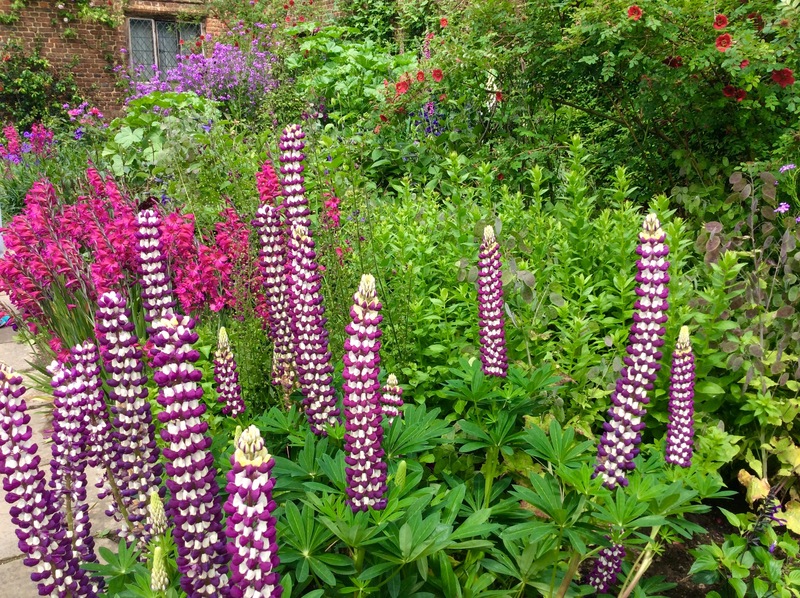 I think those tall flowers with the white are actually Lupins – they were certainly very striking. Happy significant birthday! I had one of those recently too, though I am not using any of the terms that others may think apply. All birthdays are big numbers now, and that’s a good thing. It’s quite an achievement. The gardens of the Home you visited look beautiful, and the story of its owners interesting. Hi Norah – and a belated happy birthday to you, too! Thanks for the birthday wishes, Jenny. I don’t mind prolonging the celebrations! Enjoy your summer break and your next painting project. I look forward to hearing about it. That’s exactly it – a membership has to be worthwhile. I’m sure I will have exhausted everywhere on offer in the immediate vicinity within a couple of years, if that. It seems pointless to keep it going on the off chance of going somewhere else in the country. I can’t imagine why people would become lifetime members, but there you go. It’s on offer at huge cost, so I guess some folk do! Isn’t the whole idea of discounts to entice people to join? Most people are going to say no thanks if they realize they have to join for five years to get the price break. Who thought up this foolish marketing idea? And, as you put it, by the end of five years, you will have done many of the things you’re eligible to use the discount on. Well, it’s certainly an alternative marketing strategy and not one that makes sense to most folk, it would seem. I’ve already had two friends who are already members and entitled to the discount phone me up after reading this to tell me they weren’t aware of the offer once they’d completed five years – so the Trust keeps it quiet, anyway. This makes me even more determined not to keep renewing! Sounds like you and I were born around the same time. My recollection of both the Beatles and Woodstock is nil, although I was around for both, as well. Jenny I’m beginning to think the NT must actually like and cultivate this arms-length attitude to the public. They’d be happy to collect the membership fees but not to actually admit visitors. By contrast I visited three places in Cork recently (Elizabeth Fort, Nano Nagle Place, Crawford Art Gallery) and in each case the staff made positive efforts to engage, assist and inform. It really does make a difference. Hi Roy. You’re right, the Trust certainly has an odd approach to its pay roll! When I go to places that are run independently there is always a marked contrast in the welcome and the knowledge of the guides or volunteers. Maybe I’ve just been lucky ( or unfortunate, depending on your point of view! ), but it’s left me feeling that the attitude needs to change to recruit more members and keep the ones they have. Hi Jenny, I’d forgotten that you had a milestone birthday this year (hang on, that was in March, when I saw you last) did you let on which one it was? Sorry if I missed it but belated milestone birthday! Hope the course is going well. We must catch up soon. I didn’t know about the free open day, either. They manage to keep that pretty quiet too! Your photos cheered me today. So lovely. Thank you for stopping by, I’m glad you liked them.